I currently have the pleasure of working alongside the brilliant team at the People’s History Museum, which most recently involved a day of events celebrating the National Festival of LGBT History. As part of the Festival, I ran a stall promoting the Museum’s new community-led LGBT+ project entitled Never Going Underground, taking place in 2017 to coincide with the 50th anniversary of the partial decriminalisation of homosexual acts; in partnership with Manchester Lesbian and Gay Chorus, LGBT Foundation, Proud 2b Parents and The Proud Trust. Throughout the day, thoughts and feelings about past, present and future LGBT campaigns were gathered and captured from the festival attendees and much conversation was had. Then all of a sudden, around mid –morning, a woman arrived at the Museum with a sense of urgency, keen to know where one of the talks about gender was due to take place. She seemed anxious, looked at me and said: “My son has come out as transgender”, then paused and waited for me to respond to those words which were still unfamiliar to her. I greeted the news with a big smile and replied, “How wonderful!” She looked relieved: “I need to talk to somebody about it. Can you help?”. “Of course”, I said. Within the hour, in between talks and events, Kate Hardy (LGBT Foundation’s Health and Wellbeing Officer) and the woman were busy arranging to meet. The woman had come across the Festival online and thought she may find help there. Which is exactly what she did. Her son’s life is already better. At that moment she too became part of an entirely new LGBT+ family, and it was just as important to welcome her within an inclusive space, as it was to ensure she had the right support for her son. Inclusion is such a powerful thing. As an LGBT+ person, to be part of an environment that includes you, respects you and positively celebrates you is something perhaps others take for granted. Being part of a Festival that achieves these things is particularly special. Cultural spaces are as much about belonging as they are about storytelling and the People’s History Museum do it brilliantly. Sixteen year old work experience student Sylvie Copley provides her thoughts on the parties after spending two and half days working on Election! Britain Votes. When I started work experience at the museum I knew nothing about politics – apart from that the man in charge is a Conservative. Now after two days working on Election! Britain Votes I feel as though I can give a justifiable opinion on the current situation. I got my first insight into the world of politics and how the voting system works from looking round the exhibition. From initial viewing I had made up my mind that I was a supporter of the Green Party – that didn’t last long. After spending a bit more time there, I overheard a TV interview of the leader of the Green Party, Natalie Bennett and quickly changed my mind. My next job was to sort out the voting slips for the public which had 6 questions for them to ‘vote’ with and I recorded the details here. On my second day I looked more at each of the parties. I was asked to find and print off many of the election posters for each of the parties and so got a tiny insight into what each of them meant. From these, I had decided that one’s targeting other parties obviously didn’t have enough to say about themselves and I most definitely disagreed with the UKIP poster about paying for maths and science students to be educated for free – our future does not just revolve around numbers! Will you be voting and why? – ‘Yes- There are too many people voting in pointless ‘games’ such as ‘I’m a celebrity’ and ‘Big Brother.’ – get off your arses Britain and vote for better terms and conditions’ and ‘Yes – People fought and died to let this woman have a vote!’. Many of the responses I picked were for their comedy, passion and simply because the argument was good. Through the visitors opinions at the exhibition I have been taught any different opinions and extreme ideas within politics. I have come to realise that many people get very aggressive in the way our countries ran – however I believe by sticking to voting we can continue to have our say and have no need for the aggression at all. This led me on to researching each of the three main parties, Conservatives, Liberal Democrats and the Labour Party. Each of which I was not impressed! To sum it up, I found the Labour Party wanted to tax the rich, and Lib-Dems were stuck in between and Conservatives hadn’t really done much! As much as I agree that a lot of things politicians promise do not get done, surely we should carry on voting for the member of our constituency. In the long run politicians will carry on changing, but in the short run the people who make the biggest difference to our lives are our local representatives, our vote therefore will still count. 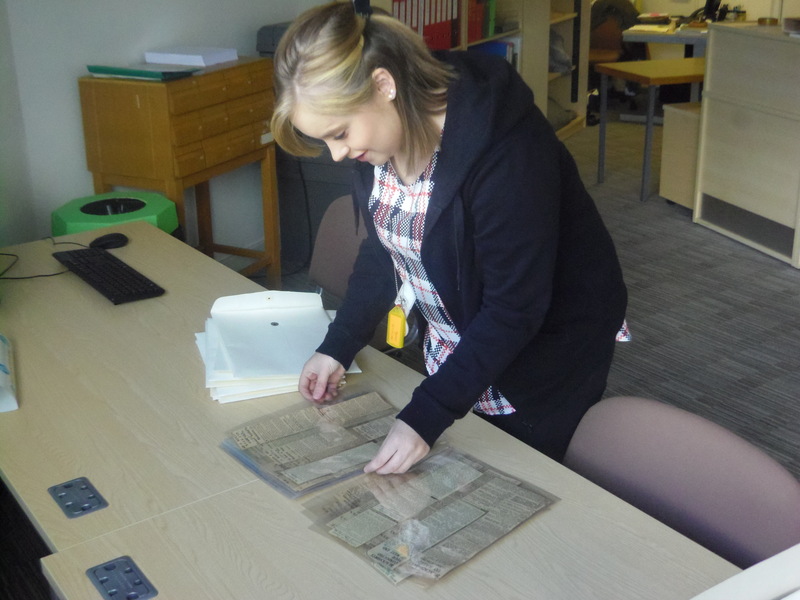 I’m currently undertaking an HLF Skills for the Future Social History Curatorial Traineeship. The traineeship is for a year and I’m about half-way through. The aim of the traineeship is to provide workplace training for people who want to pursue a career in the museum or heritage sector. My host museum is The Herbert Art Gallery & Museum in Coventry, but as part of the traineeship I’ve been doing a two-week placement here at the People’s History Museum in order to gain some experience of working in a national museum. I’ve managed to fit in a variety of different tasks and activities into my two weeks here. I’ve also had a good chance to look around the museum and learn more about the collections that are held here. One of the tasks I have been doing and very much enjoying is writing labels for trade union banners. The museum has the largest collection of historic trade union and political banners in the world. The banners are changed in the main galleries once a year in order to give the banners a rest and to do conservation work on the banners where needed. The banners will be changed in January 2015. 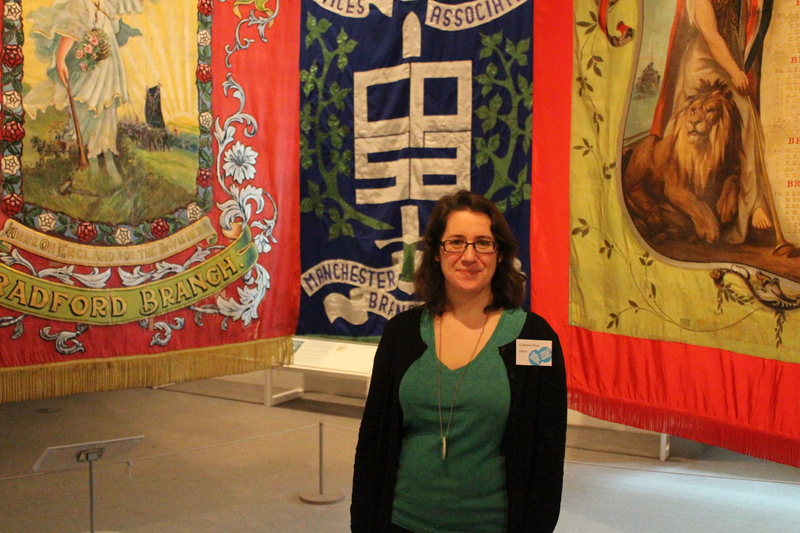 It has been really interesting to research some of the histories of the banners and of the trade unions themselves and to develop further my skills in writing museum text. You can get an idea of the scale of some of the banners from the picture of me standing in the banner section of Main Gallery Two! I was fortunate enough to spend a morning in conservation, where I got to see some of the banners I have been writing about being conserved. Banners can present some unique problems in terms of their need for conservation. PHM have produced this booklet which explains more about the care of banners. My day spent working in the archives was also really interesting. I catalogued some photographs of CND demonstrations in the 1950s and the 1980s, which gave me an introduction to some of the collections held in the archives here and some experience of archive cataloguing. I also took part in some activities which were more public-facing. I helped to staff a stall at the HMRC offices as part of their Learning at Work day. This was a very good way to learn more about the museum and what it offers, and also learn more about the work the Learning Team do. People definitely seemed interested and engaged with what the museum has to offer, so I hope we encouraged some new visitors. I also learnt more about the museum’s learning programme by sitting in on a school session led by the Parliament Education Service as part of Parliament Week. It was interesting to see how the children were being engaged in the political process (and enjoying themselves at the same time!) with the activities they took part in during the session. Spending a day with the Front of House team was a good way to engage with visitors directly and also see how the museum operates on a day-to-day basis. I helped to greet visitors when they arrived and patrol the galleries. It was great to get feedback from visitors and see how they reacted to the objects on display. I also had the chance to engage with members of the public when I took control of PHM’s Twitter for the day. I learnt how time-consuming managing a busy Twitter account can be! I also used Instagram for the first time and did an update on the museum’s Facebook page. My day on Twitter seemed to generate quite a lot of interest and I got lots of retweets and favourites. I feel like I learnt more about what works well on Twitter and how things like the time of day can affect people’s engagement. As you can see, I’ve had a jam-packed two weeks – I have not even covered everything I’ve done in this blog post! I’ve also met with various key people in the organisation to learn more about their job roles and the different teams in the museum. The staff have helped to make my time here productive and enjoyable, as well as contributing towards my learning as part of my traineeship. I am sad to leave, but also feel very lucky to have had this experience. I would recommend the PHM as a place to visit, work or volunteer. The Social History Curatorial Traineeship is a Heritage Lottery Fund, Skills for the Future Programme supported by Birmingham Museums Trust. I am a third year History, Museums & Heritage student from the University of Central Lancashire, currently volunteering at the People’s History Museum. For the past couple of months, I have been doing research for the upcoming exhibition, Election! Britain Votes, looking at a wide range of election material such as posters, leaflets and manifestos. I am also currently working with artist Alex Gardner, showing him the most interesting and visually appealing items from the election material in the Labour History Archive to inspire the design of the exhibition. 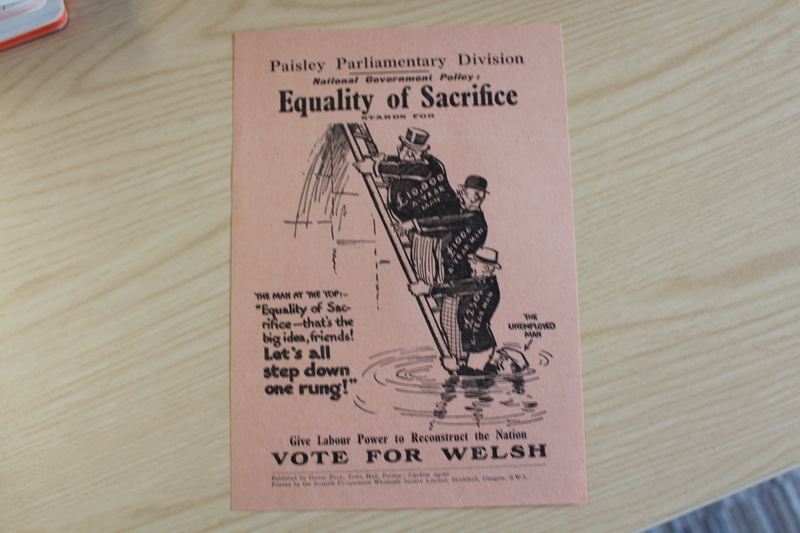 This Labour Party poster criticises the 1931 National Government and their ‘Equality of Sacrifice’ policy. This policy was based on the ideas of John Stuart Mill, who believed that tax laws are fair as long as they are applied to everyone equally. The cartoon, by J. F. Horrabin was created in 1929, at a time of economic depression in Britain. Each man on the ladder has a different income, and as each one steps down a rung, the unemployed man at the bottom of the ladder becomes submerged in water, suggesting that the equality of sacrifice would affect the poorest the most. 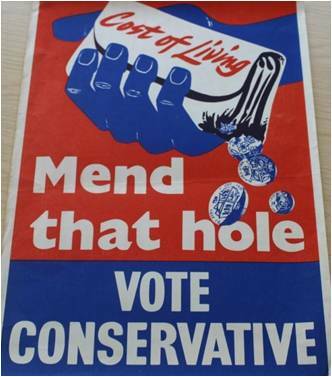 This Conservative Party poster created in 1951, shows a purse with coins falling out of the hole at the bottom of it. The purse has ‘Cost of Living’ written on it, which implies that the cost of living is increasing and that people are losing money because of it. This poster is particularly interesting as it is not far from issues that affect us today, such as the current debate about implementing a living wage due to rising cost of living standards. My favourite item so far, and arguably the most engaging, is this 3D booklet which was created by the Conservative Party in 1950. The booklet folds so that when you put the blue filter over the text, it lists the successes of the Conservative government and what they aim to do in the future, and when you choose the red filter it shows the failures of the Labour government. 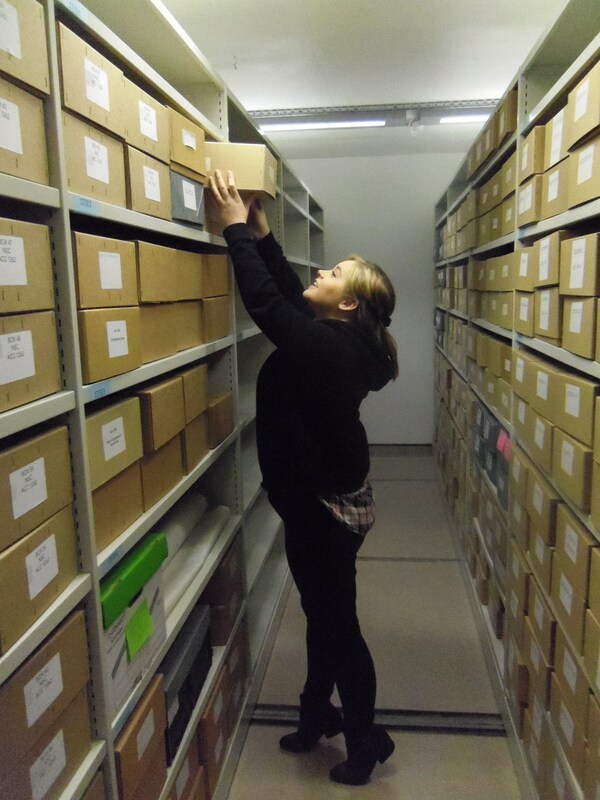 Emily Fisher is currently on placement in the Labour History and Archive Study Centre, in this blog, she tells us about her placement. I’m a third year student at the University of Central Lancashire, studying Modern World History. For one of my third year modules I am doing a work placement. I chose to go to the People’s History Museum in Manchester as I wanted to gain an insight into the life of an archivist, whilst working alongside historical artefacts. Working in an archive has made me realise just how hard archivists work to preserve some very delicate historical artefacts, whilst helping the general public engage with the vast amount of collections available. I find it very important to have archives available as it allows people to look into the history that has essentially shaped their future. Overall, I have found the placement extremely interesting and I would recommend anyone to go and be a volunteer at the People’s History Museum. The staff are very warm and welcoming, and the amount of pamphlets, pictures, newspaper cuttings, publications, letters etc, is extremely impressive. The Labour Party won their way back to office by a margin of four seats in October 1964, leading to Mr Harold Wilson becoming Prime Minister. The election ended a chapter of Conservative rule which begun when the Churchill Administration came back to power in October, 1951. Mr Wilson, who had repeated during the election a promise of 100 days of dynamic action, announced the first six members of his Cabinet and his Chief Whip on the night of October 16. He named the first of six ministries, Economic Affairs, with Mr George Brown, deputy leader of the party, at its head as First Secretary of State; and included Mr P. Gordon Walker, who had lost his seat at Smethwick, as Foreign Secretary. In quick succession over the next three days came the others. Mr. Frank Cousins, general secretary of the Transport & General Workers’ Union, was brought in to take charge of a Ministry of Technology (with Sir Charles Snow later chosen as his Parliamentary Secretary); Mrs Barbara Castle went to a new department of Overseas Development; Wales was given its own department under Mr. J. Griffiths; and a Ministry of Land and Natural Resources was set up under Mr. F. T. Willey, who was not in the Cabinet. Sixty-two by-elections were held during the last Parliament. 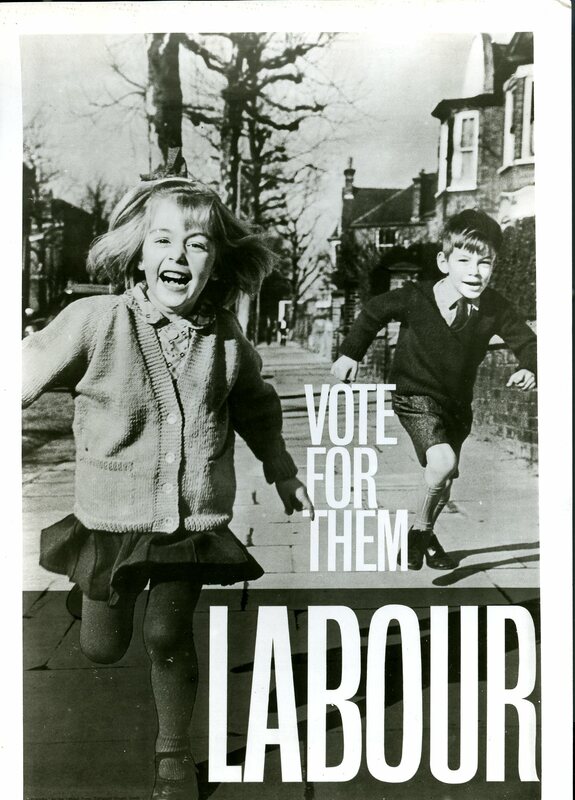 In the first (March, 1960) the Conservatives wrested Brighouse and Spenborough from Labour, but in subsequent contests Labour won Middlesbrough (West), South Dorset, Glasgow (Woodside), Rutherglen, and Luton and in March 1962, the Liberals overturned a Conservative majority of 14,760 at Orpington and won the seat majority of 7,855. 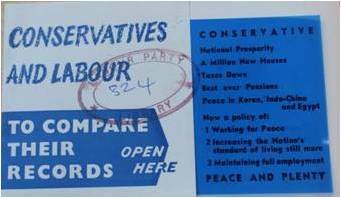 Both the Conservative Party and the Labour Party elected new leaders during 1963. Mr. Hugh Gaitskell died on January 18, 1963, at a time when his authority over the Labour Party was absolute and his political stature was unanimously acknowledged. Mr Harold Wilson, Mr George Brown and Mr James Callaghan competed to fill the vacancy, and a second ballot among the Parliamentary party established Mr Wilson as the new leader with a majority of 41 votes over Mr Brown. Mr Aneurin Bevan, Labour’s deputy leader, died in July, 1960. Reforms in the departmental structure of government were implemented in the last session. A unified Ministry of Defence was created to achieve centralised control of operations. Boards for the Royal Navy, Army and Royal Air Force were established under Ministers subordinate to a Secretary of State for Defence. The coordination of educational development under the direction of a Secretary of State for Education and Science brought about the appointment of two Ministers of State, for higher education and science, and for the state schools system. A guest post from our fab volunteer Sarah Taylor who is busy organising our PHM Fun Palace. 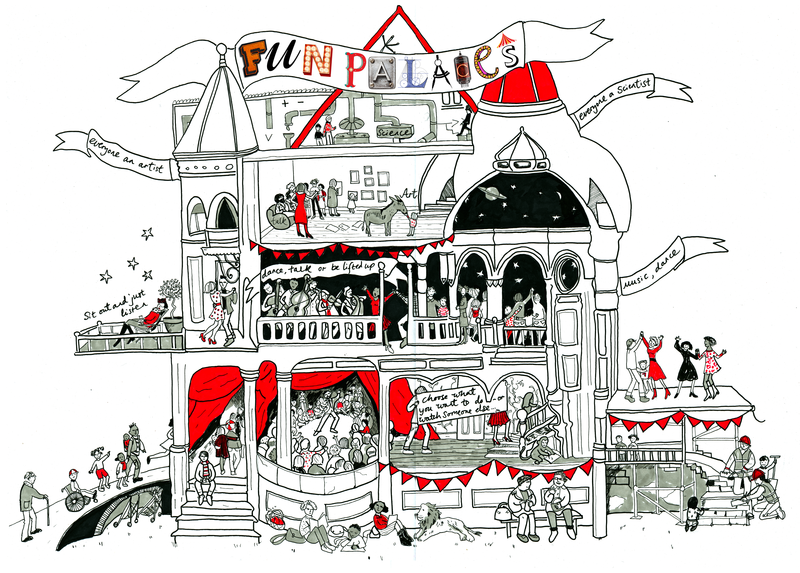 We are holding a Fun Palace on Saturday 4 October! Over that weekend, Fun Palaces are going to be popping up all over the country, celebrating arts, sciences and everyday cultures. Our Fun Palace will be all about Manchester’s history. Come down and join us for a chance to learn all about our wonderful city. They’ll be opportunities to ask questions about things you’ve always wanted to know, share your favourite Manchester memories and even make your own ice cream cone (unfortunately not edible!) – did you know that the twist ice cream cone was invented in Manchester?! So don’t hesitate to get involved via twitter and come and visit our Fun Palace on Saturday 4 October!